Home > General > Welcome our 2019 Interns! 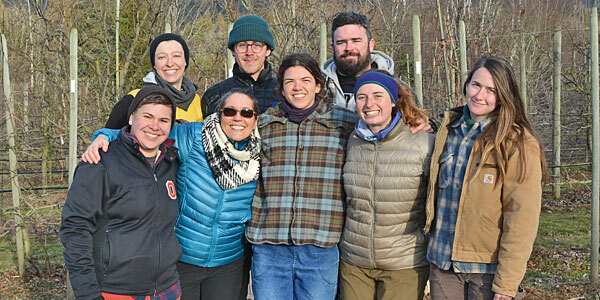 Every winter we welcome a new group of interns for a season of working and learning on the farm. The first week of March we welcomed eight new people to the team, each person bringing a unique set of skills and experiences. Over the course of the next eight months we will work together to steward the land, grow food, and learn about starting a farm business. 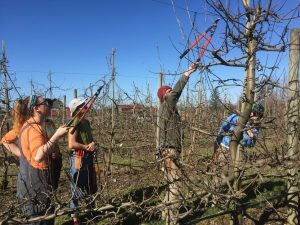 The season started as it usually does with winter pruning in the orchards and vineyards, training trees and vines for optimal harvest six months from now. We also do most of our nursery propagation this time of year, which means grafting and sticking cuttings with both wine and table grapes. The work will shift from perennial crops towards our annual vegetable production as we swing towards warmer temperatures and spring. The greenhouse is slowly filling with trays of seeded vegetable starts: onions, kale, lettuce, tomatoes, peppers, and more. 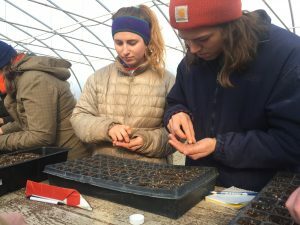 Interns will rotate through taking care of the seedlings in the greenhouse, making sure every seed has enough moisture, light, and air to develop into a healthy transplant. The CMFC Internship program is designed for beginner farmers, who are on the path towards eventually operating their own farm businesses. We are excited to support and mentor these beginning farmers, equipping them with skills and experience to make a positive impact on our local food system. 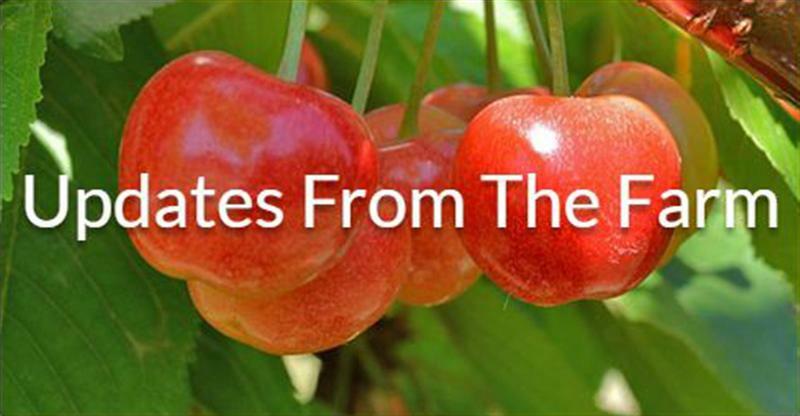 In the coming months we will visit many other farms and host guest speakers, covering a wide variety of topics from pest management to soil science to making a marketing plan for your farm business. Farming is a lifetime of learning, as many of the long time growers will tell you, requiring plenty of patience and observation. We are happy to embark on this journey with our new interns and looking forward to all that the seasons bring!